This crowd surely belongs to the start of an album, not to me, swaying on the grass at Afropunk Fest this weekend to Erykah Badu, who I usually associate with arriving at the Albany for work, where she’s a regular on the cafe sound system. But that’s one of the beautiful things about being here. I felt both at home and entirely foreign. Next to us in the crowd, we met people from Brixton and Goldsmiths. But then there was also the brilliant moment when Mos Def came on stage, unannounced, and we were the only people who didn’t immediately realise who he was. There was the impassioned speech by a local councillor, “this isn’t about race, this isn’t about age, this is about Afropunk”. Something I cannot imagine a Lewisham councillor pulling off unscathed, right before the headliner. All this was part of the beauty of the evening. 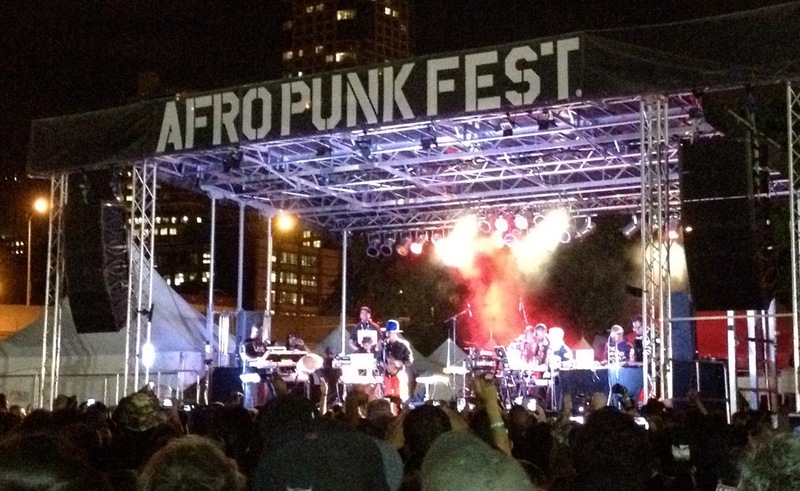 Rolling Stone has written a good article here which takes in Afropunk’s reason for being and how this has changed over the festival’s eight years. It’s definitely interesting being a foreigner in the audience. On Sunday I went to the Upright Citizens Brigade Theatre for a free comedy improv show. It was a bit like being invited to someone else’s family dinner, where you can enter only partially into the jokes, some of which were universal (meerkats), some local and some totally baffling to me. One sketch involved somebody’s English cousin arriving in New York, and the disappointment and confusion from both sides about un-met (and met) stereotypes. We’ll see whether that turns out to be the case. This entry was posted in New York Notebook and tagged Afropunk Fest, Miriam Nash, New York Notebook, Upright Citizens Brigade Theatre. Bookmark the permalink.